Last updated 04 September 2017 . By Millie Smith. As a new-ish resident of Battersea, I’ve managed to tick off most of the pubs in the area. Great for people watching/celeb spotting, my new local now knows to pop a straw in my Aspalls, and I’m almost on first name terms with the waitress at the all-you-can eat sushi place opposite. Formally the Lost Angel and sister venue to Lost&Co in Putney, I watched as the scaffolding came down from the front of Lost & Co Battersea, eagerly awaiting a time to visit, post their big refurbishment and name change. Looking for something a little different to the traditional pub offerings closer to the park, we finally got the chance to head down on a sunny afternoon to see what Lost&Co has to offer. Considering it’s one of the best all-in-one party pub venues in South West London, as we strolled in on the sunny Sunday afternoon, there were no signs (or smells) of the 2am Saturday night shenanigans that took place hours before. We took a seat at one of the booths at the front of the venue where a few couples were having chilled lunches, and friends were sat catching up on last night’s events over Bloody Marys. The huge windows which paint the bar in a welcoming yellow glow, also provide the venue with a cosy warmth which was very welcome in our semi-fragile states. The pub feels clean and fresh after the refurbishment, with grey sofas, yellow stools, modern copper wire lampshades and painted brickwork. Lost & Co has all the feels of a trendy London bar, without the usual pretentiousness. 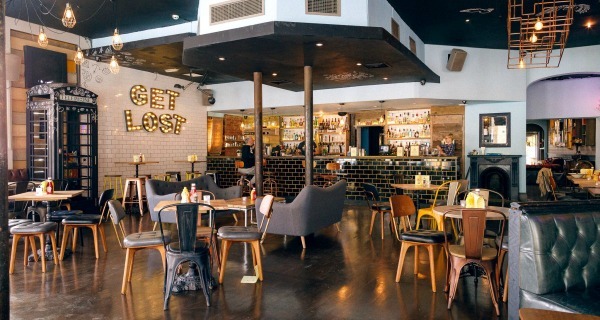 Lost & Co Battersea has many faces, from daytime hangout through to party-happy bar come the evening. Amongst the extensive list of quirky cocktails, Lost & Co also offer a varied wine list and craft beer selection. As we had come for a roast, we opted for two beers to start, an Amstel for my friend and a pint of Coast to Coast Pale Ale for me. Ten years ago I was partial to a Stella and Lime, I haven’t had one for a long time but the but the crisp, citrusy freshness of the Coast to Coast Ale definitely ticked the box for a Sunday afternoon beer and offered up a welcome adult version of an old teen favourite. A fun venue needs a fun menu, and Lost & Co’s food offers you no less. Their Monday to Saturday offering contains burgers and chicken wings with flavours like ‘Strawberry + Peanut’, ‘Vegemite’ and ‘Bloody Mary’. Their main focus is the quirky pizzas with options such as, ‘This Little Figgy’ - Fig, Goats Cheese, Chicken and Rosemary, and ‘Cloudy With a Chance of Meatballs’ - Meatballs, Sun Blush Tomatoes, Spring Onion and Artichokes. There are vegan and vegetarian options too which means everyone stays happy. As well as the weekend brunch menu, on Sundays they also offer you your classic roasts. With two more beers we ordered the pork belly and the lamb rump (both £14.50). I think it’s fair to say that London pub roasts are hit and miss, the bad ones often leave you feel disappointed - the meat is overdone, the potatoes are stale and cardboard-y and vegetables over cooked. This was in no way the case for Lost & Co, which provided us with a couple of the best roasts I’ve had in London. The potatoes, a key part, were perfectly seasoned and salty; fluffy in the middle and crispy on the outside - like giant chips swimming in gravy, they were all too moreish. Both the lamb, minty and flavoursome, and the pork, moist belly with crunchy crackling, were perfectly cooked too. The carrots, green beans and red cabbage finished everything with an al dente and fresh hit. 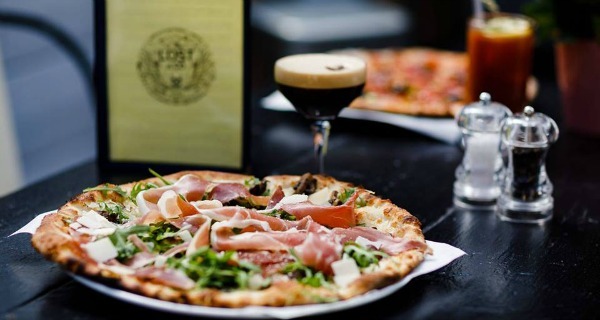 It's not just one of London's best roasts; Lost & Co Battersea also whip up some unusual pizza and chicken wing mixes. Whether you’re after brunch, a quiet afternoon pint or dinner and dancing, Lost & Co will keep you entertained and give you what you’re after. Their friendly staff and relaxed atmosphere make you want to stay all day - and as it’s open until 2am at weekends, you can. The venue also has a few spaces which you can hire, so if you’re looking for something more private they can host your party. A great all in one venue ticks all the boxes, and Lost & Co Battersea certainly offers you the whole package meaning you’ll be back again and again - I for one am planning my next visit to try out the Strawberry and Peanut Chicken Wings.